A new study published by research firm KPMG reveals that only 16% of the most popular and critically acclaimed films are available via Netflix and other on-demand subscription services. The study, which reveals that availability through other platforms is excellent, is praised by the MPAA, but the big elephant in the room is conveniently ignored. There is little doubt that, in the United States, Netflix has become the standard for watching movies on the Internet. The subscription service is responsible for a third of all Internet traffic during peak hours, dwarfing that of online piracy and other legal video platforms. It’s safe to assume that Netflix is the best and most convenient alternative to piracy at this point. That is, if the service carries the movies people want to see. This appears to be a problem. Research firm KPMG has just released a new study that looks at the online availability of the 808 most popular and critically acclaimed films. The study was commissioned by NBC Universal and praised by the MPAA, presumably to dispel the argument that many people pirate because they don’t have the option to watch some films legally. “This first-of-its-kind report analyzed the availability of 808 different film titles over 34 major online video distribution services and found that 94 percent of the films were available on at least one service,” MPAA’s Chris Dodd commented on the study. The MPAA is right that most of the movies are available through online stores and rental services. However, the Hollywood group conveniently ignores the lacking availability on popular subscription platforms which services such as Netflix and Hulu use. This is not a minor oversight as the study finds that availability of top films on Netflix and other subscription services is very low. 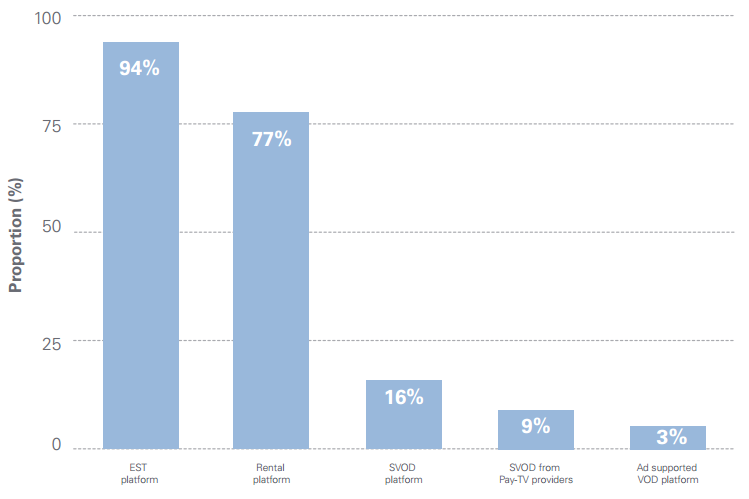 Although KPMG decided not to mention it in the executive summary of the report, the findings show that only 16% of the films are available through on-demand subscription services (SOVD). The above sheds a different light on the availability argument. Because, what good is it if 94 percent of the films are available online, but (at least) 84% are missing from the most-used movie service? After all, most people prefer to get their movies in one place as it’s not very convenient to use a few dozen services to get your movie fix. Of course this is not an excuse for people to go out and download films without permission, and we have to admit that a lot of progress has been made on the availability side in recent years. However, Hollywood can definitely learn from the music industry, where most of the popular content is available through subscription services. From the availability point of view there’s another issue worth pointing out. The most pirated titles are usually recent releases, and these are generally not available, not even through iTunes, Amazon or rental services. This is also illustrated in the KPMG report which shows that 100% of the top 2012 films are available online, compared to 77% of the 2013 releases. It’s probably safe to say that the majority of all pirated downloads are of films that are not yet legally available. In other words, there’s still plenty of improvement possible.